Fun With Puzzles Brain Teasers Kids Puzzles Odd One Out Picture Puzzles Puzzles Puzzles for Teens Which Bento Box is Different? Which Bento Box is Different? Here is very interesting Odd One Out Picture puzzle. In this puzzle there are three Bento Boxes cooked in Sara's Cooking Class. Two of these boxes are exact same. However one of these boxes differs slightly from others. 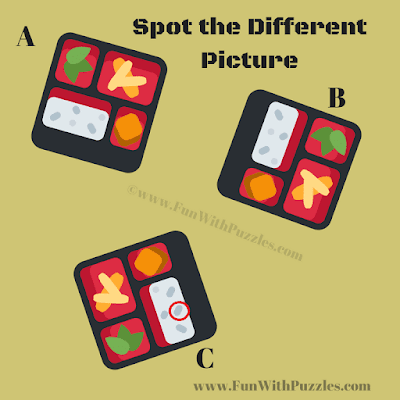 Your challenge is use your observational skills and find which Bento Box is Different. Can you Spot this Different Picture? Can you spot which picture is different? Answer of this "Which Bento Box is Different?" puzzle, can be viewed by clicking on button. Please do give your best try before looking at the answer. 1. Lumosity Brain Training Mobile Games: Do you have a smart phone and will love to play games on it. If yes, then do try out Lumosity Games which will not only twist your mind but also enhance your brain power. 2. Elevate Brain Training Mobile Games: In case you are looking for Maths and English word games then Elevate Brain Training Games is the one which you should be playing on your mobile phone. 3. Eye and Brain Teaser Stereogram Picture Puzzle: Do twist your eyes and brain by looking at these Stereogram 3D pictures. 4. Consecutive Sudoku Puzzle: In case you like to solve printable Sudoku puzzles, then checkout this very nice Sudoku variation called Consecutive Sudoku.